Let's Dance is an album by David Bowie, released in 1983. It is a post-disco album with co-production by Chic's Nile Rodgers. 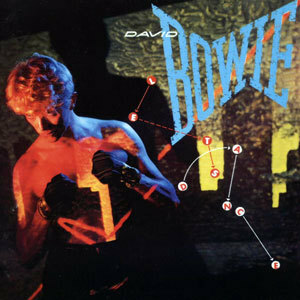 The first three songs on the album, "Modern Love", "China Girl", and its title track, respectively, have become standards and three of Bowie's 80's classics. "China Girl" was actually a new version of a song which Bowie had co-written with Iggy Pop for the latter's album The Idiot. Let's Dance is also notable as a stepping stone for the career of the late Texan blues guitar virtuoso Stevie Ray Vaughan, who played on the album. It was also available as a limited edition Picture Disc which on one side shows the album front cover photo along with the track listing, while on the other side it says "Serious Moonlight Tour '83" along with a concert photo.